October 23, 2013 by LindaJoy Rose . Posted in " Main Meals, Miscellaneous, Petit Plats, Raw Fusion Solution, Recipes, Salads, Sandwiches, Sides, Snacks, Sweets " . Tags " cinnamon, gluten-free wraps, persimmon, pumpkin pie spice, pumpkin wraps " . Rounding out my Pumpkin-Palooza seasonal recipes, I decided to make a batch of dehydrated wraps, using the same basic recipe as the Curry Coconut Wraps but with the addition of some canned organic pumpkin and spices. These can be fully raw if you substitute with raw pumpkin, butternut squash or sweet potato. These are so tasty that they were perfect as either a savory or sweet recipe-builder. 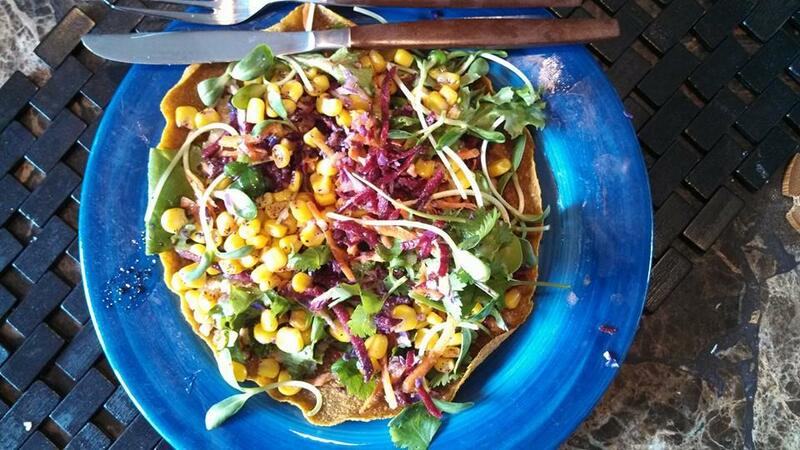 Pictured to the left is a “tostada” which I spread with cashew spread (soaked cashews processed with tahini, coconut nectar and garlic) and topped with a virtual rainbow of fresh greens, sprouts and shredded root veggies. The recipe for the wraps below – they are very simple to make in a dehydrator and stay fresh for several days. 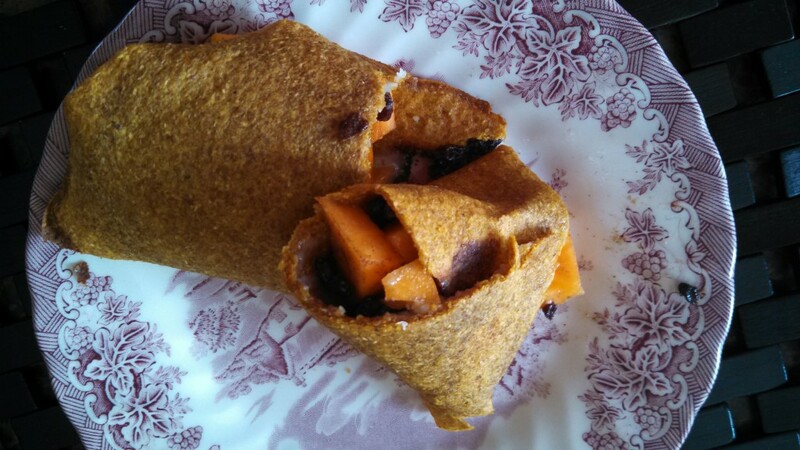 Make sure to check out my morning wraps — spread with macadamia butter, chopped persimmon, currants and cinnamon. An absolute delight with a vanilla rooibos chai and almond milk latte! Directions: Grind the flax seeds in dedicated coffee grinder or high-powered blender, making sure unit and seeds are dry. This will turn the flax seeds into flour. In a food processor, combine all the ingredients & process to form a smooth batter with the consistency of thick cream. Check the sweetness – you can add 1/2 an apple instead of using the honey/agave. 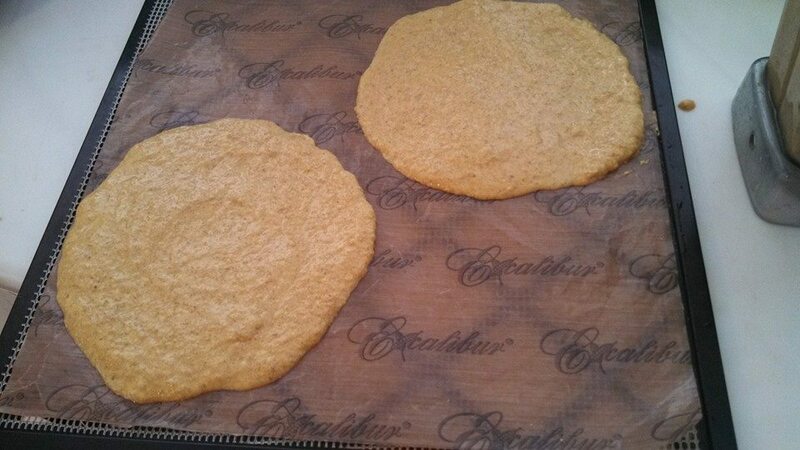 Spread the batter in4- 8 inch round circles (or single sheet) on Teflex sheets. Shape with a spoon or spatula. Dehydrate at 115 degrees, allow top to dry 3-4 hours to where it is easy to peel from the teflex sheet and flip over onto the screen and dry another 3-4 hours. Do not let them become too dry or they will become brittle. Leftovers can be left out for a day or two if they are wrapped but can also be refrigerated or frozen. Take out and let to come to room temperature before using. 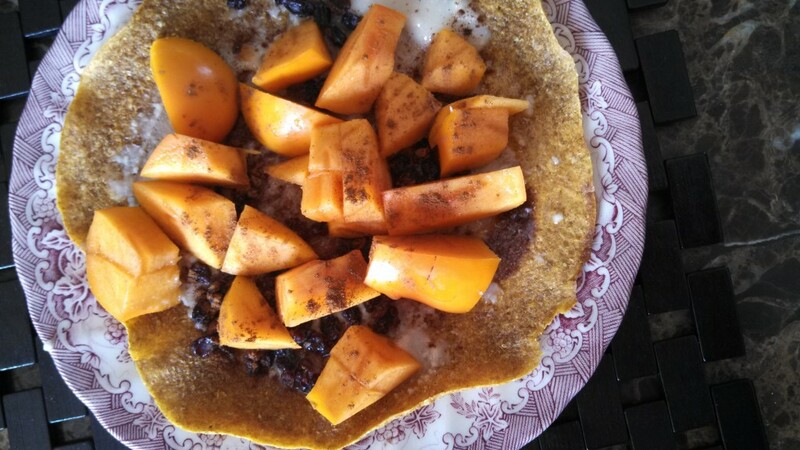 For several mornings I enjoyed a breakfast wrap, spread with macadamia butter, chopped persimmon, currants and cinnamon. An absolute delight with a vanilla rooibos chai and almond milk latte! Where, oh where has my energy gone? Spring into Raw with Sweet & Spicy Cashew Wraps! In "Recipes, Snacks, Sweets, Videos"